Cruising has long been considered an affordable vacation option for couples, groups, and families. With cruise ports dotted across the country, if you live near a coastline, you could probably drive to your departure port and save money on airfare. And with your food and entertainment included in the cruise fare itself, the bulk of your vacation expenditures are paid for upfront. Once you pay for your cruise, plus applicable taxes and port fees, you'll have little else to cover other than transportation, tips, alcohol, and cruise stop excursions. Of course, creative cruisers have been saving in other ways for years. With some out-of-the-box thinking, there are numerous ways to save on common cruise "extras" or avoid them completely. 1. Book when "kids cruise free"
With onboard kids' clubs, pools, water parks, and endless family-friendly activities to choose from, most cruises are ideal for families with kids. Still, you may be able to save even more if you book a cruise where "kids cruise free." Believe it or not, some of the most affordable cruise lines for families waive cruise fare for kids on at least some sailings. For example, MSC Cruises has the most enticing offer, which is year-round. On many of their Caribbean cruises, children ages 11 and under cruise free with paid adults. Keep in mind, however, that even "free" kid cruises require the payment of government-mandated taxes and port fees for your stowaways. While many people plan their cruise vacations far ahead of time, you can save a bundle if you wait until the last minute. A website called VacationstoGo.com promises up to 82 percent off unsold cruises that depart within 90 days. At the moment, you can score a six-night Alaskan cruise on Norwegian for as little as $449, or a four-night Caribbean cruise on Carnival for as little as $224 per person. A seven-night French Polynesia cruise on Paul Gauguin that retails for $7,000 per person can be had for $2,499 per head on certain dates. Keep in mind, however, that the lowest discount fares usually apply to interior rooms and may not include taxes and port fees. An array of rewards credit cards let you earn points redeemable for any cruise of your choosing. Most of the best travel credit cards offer this option, especially flexible cards. Carnival and several other cruise lines offer their own co-branded credit card with a sign-up bonus and ongoing earning potential, as well. 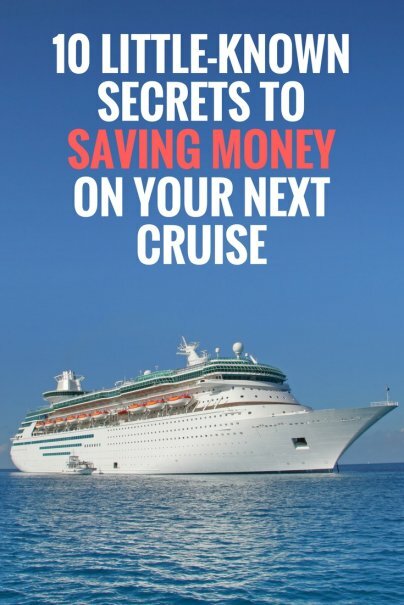 If you want to save money, it helps to check out the best credit cards for cruises ahead of time. While cruises include food, snacks, entertainment, and some drinks, most don't include alcohol in their regular cruise fares. Unfortunately, onboard drinks are notoriously expensive, and they can really add up if you don't watch it. The good news is, you may be able to bring your own booze on board — specifically wine. Each cruise line has its own policy. For example, Carnival lets you bring up to one bottle of wine per person in your luggage on embarkation day. Cruises are interesting because they let you visit multiple destinations with a diverse offering of activities. On the flip side, "excursions" are not generally included in cruise fare and can be expensive on their own. Sometimes excursions can cost as much as the cruise itself! Most of the time, you can avoid cruise ship markup by booking excursions yourself. Imagine your Carnival cruise stops in Aruba and you want to go snorkeling in the crystal clear waters. You could book Aruba's Dushi Sail & Snorkel excursion with lunch through Carnival for $89.99 per adult, or you could book directly with the operator for $61 per adult. Websites like Viator.com are especially helpful when it comes to booking shore excursions at a discount. Most cruise stops offer free stuff to do in addition to paid shore excursions. If you're creative and flexible, you can enjoy each port without paying an arm and a leg. Most beach destinations have free public beaches, and other stops let you sightsee or visit parks for free. Cruise critic forums are a great place to get ideas for free stuff to do. You can also gain insights on local bus routes that will take you away from the port and off the beaten path for cheap. Cruise "status" works a lot like hotel or airline status. If you cruise with the same cruise line often enough, you can eventually earn status upgrades good for cruise discounts, room upgrades, early boarding, and additional perks. But, what if you're tired of cruising with the same company over and over? While it's not well known, cruise lines will occasionally "match" your status to earn your business. MSC Cruises does this all year long, and will match your cruise or even your hotel status to earn your business. When cruise lines need to move their ships from one place to another during seasonal changes, rather than sending an empty cruise ship, they will often offer a repositioning cruise at a steep discount. These one-way journeys — say, from Alaska to Hawaii — may offer a few stops in the early part of the trip, but otherwise, you are at sea for much of the time. You can still enjoy the sea views and take advantage of onboard activities. You can shop for repositioning cruises on any cruise website, and on discount travel websites like Expedia and Travelocity. You can also scoop even lower fares on repositioning cruises through VacationtoGo.com. Cruising to multiple international destinations sounds like a lot of fun, and using your credit card is usually the best way to get around without exchanging currency. Unfortunately, many cards charge a foreign transaction fee that tacks an extra 3 percent onto everything you buy. You can get around these extra charges by signing up for a credit card with no foreign transaction fees before your cruise. Some cards that fall into this category have rewards programs that make them even more valuable, and/or come without annual fees, too. If you're into credit card rewards and have your heart set on a specific cruise, it can pay to combine both goals into one. By purchasing gift cards for your favorite cruise line with your rewards card, you can earn more rewards over time, even using them to offset the cost of your cruise if you want. Check your credit card rewards portal to see if it offers cruise gift cards as redemption options for your points. Otherwise, use your favorite rewards credit card to purchase them.